At The Law Office of Doppelt and Forney, APLC, our main focus is protecting our clients’ rights and helping them obtain their goals. Our attorneys practice in all aspects of family law, including divorce, legal separation, child custody, child support, spousal support, restraining orders and more. Divorce can be an exhausting, mentally draining process. After filing for divorce, you will probably start wondering when the process will finally end, so you can move on. First, in order to qualify to file for divorce in California, there is a six month residency requirement. The minimum amount of time to complete a divorce is six months. During the six months, the process involves filing and serving various documents, attending meetings and conducting necessary discovery. In an uncontested divorce, this process is much shorter and easier, and the only discovery that takes place is the mandatory exchange of financial disclosures. In a contested divorce, there needs to be a reasonable amount of allotted time to conduct a thorough discovery, which could extend the time it takes to complete the divorce. Divorces with children or with significant assets usually take much longer than the six month minimum. According to Lawyers.com, the average duration of a divorce in California is 15 months. As stated before, minor children increase the length of divorce due to child custody and child support, which tend to be contested issues that take longer to agree upon. If a couple needs to go to trial, trial will also greatly extend the length of the divorce process. The court calendar is often backed up with hearings, trials, orders and judgments, which will cause delays in your divorce process. Once a Judge signs the judgement for dissolution of marriage, the judgement of divorce becomes effective. A clerk then enters the judgement into the court record and date-stamp the documents. Each party will receive a copy of the order, which will include the termination date of the marriage. When the termination date passes, the marriage is officially terminated. If you are thinking about starting the divorce process, consult with a divorce attorney as soon as possible to ensure your rights are being protected. Divorce can become very complicated, especially a divorce involving minor children or significant assets. 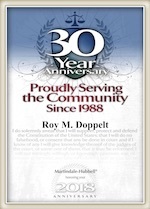 Call The Law Office of Doppelt and Forney, APLC for a free consultation at 800-769-4748. We proudly serve clients in San Diego and surrounding communities, including Coronado, Carlsbad, Encinitas, La Jolla, Oceanside, Ramona, San Marcos, and Vista. We represent clients in family law court in all of the court houses in San Diego County including downtown, Vista, Chula Vista and El Cajon.